I would like to no if the girls goes corting as this is leap year and there year to go see the boys. I think if I was at home they would shorely come to see me but if the girls will go to see the boys they will hav to go some distance be fore they will find them. And so I think if they hav any boys at home they would be better to hold on to them for the boys out here are getting prety bad." John is referring to the Scots-Irish folk tradition that women may propose marriage in leap years. While it has been claimed that the tradition was initiated by Saint Patrick or Brigid of Kildar in 5th century Ireland, this is dubious, as the tradition has not been attested before the 19th century. Supposedly, a 1288 law by Queen Margaret of Scotland (then age five and living in Norway), required that fines be levied if a marriage proposal was refused by the man; compensation was deemed to be a pair of leather gloves, a single rose, £1 and a kiss. In some places the tradition was tightened to restricting female proposals to the modern leap day, February 29, or to the medieval (bissextile) leap day, February 24. In some places, February 29 has been renamed Bachelors' Day because of the tradition. 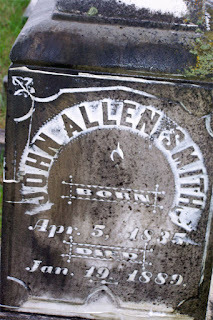 Private John Allen Smith, son of Mathias Smith and Margaret Ann Josey Smith, volunteered for service in Cabarrus County on June 15, 1861. As a member of a western North Carolina Company, the twenty-six-year-old Mill Hill resident would go on to serve as a faithful trooper in the 1st N. C. Cavalry Regiment for two and a half years. John, along with his brother Caleb, were part of the original Cabarrus Rangers, 1st North Carolina Calvary Regiment (9th Regiment, NC State Troops). Col. William H. H. Cowles of Yadkin County wrote in the February 15, 1889 Concord Times, that John Allen saved his life. When Cowles was fighting in close quarters in the midst of a Yankee column, John shot an assailant who was attacking him from behind, thus saving his life. At the death of John Allen, Col. Cowles had a monument erected at his grave site at St. Martin's Lutheran Church in Concord. Christopher M. Watford, ed., The Civil War in North Carolina: Soldiers' and Civilians' Letters and Diaries, 1861-1865, 2003.